If you have a small bedroom, you should get a small bed, right? Well, not if you're interior decorator Jen Chu. Chu, who has designed spaces for Lifetime, E! and MTV, chose to defy logic by filling her 78-sq-ft half-bedroom with an enormous bed, resulting in an ultra-efficient, multi-purpose room. 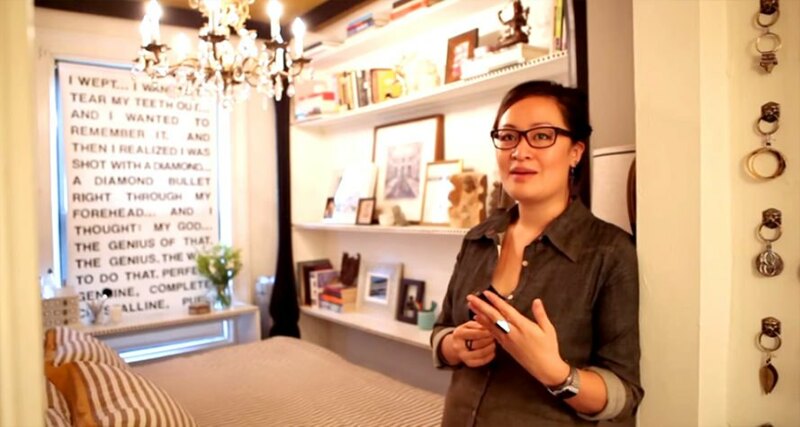 Read on to check out Spacestv's video exploring Jen's clever bedroom, and learn more about the smart design tricks she employed to transform a formerly claustrophobic room into a cozy, stylish and totally livable environment. Chu’s very modestly-sized room is actually part of what is called a “1.5 apartment” in Brooklyn, New York, where a roommate occupies a larger bedroom and Chu lives in the half-bedroom. The key to the space is the over-sized, custom-made canopy bed, which serves as a multi-purpose piece of furniture. In addition to being a place to sleep, it functions as a sofa, a chair and even a storage compartment. The impactful window treatment was made using a cheap shade from Home Depot. Chu chose one of her favorite quotes from the film Apocalypse Now, and cut the letters out of black contact paper. Since horizontal space is at a premium, Chu made use of her walls by storing and displaying her earring collection on a grid of lion drawer pulls. “When I was little, I thought I wanted to live in an RV, so in a weird way, I think living in a tiny space is fulfilling a childhood dream of mine,” Chu told Spacestv. Editor’s note: Chu actually moved into the apartment’s full bedroom about a year after the video above was made. Check out her new digs here. WHERE IS T TOILET IN TIS YOU CALL "APARTMENT"? Chu's very modestly-sized room is actually part of what is called a "1.5 apartment" in Brooklyn, New York, where a roommate occupies a larger bedroom and Chu lives in the half-bedroom. The key to the space is the over-sized, custom-made canopy bed, which serves as a multi-purpose piece of furniture. In addition to being a place to sleep, it functions as a sofa, a chair and even a storage compartment. Since there is a small space between the bed and the wall, Jen can use the bed as a seat when working on projects. A shelf functions as a desk, and another shelf near the window serves as a vanity. A cabinet built-in underneath the bed acts as a storage compartment. While the bed occupies most of the space, there is a bit of a hallway area. A swinging arm allows Jen to direct her lamp where light is needed most in the room. Chu's very modestly-sized room is actually part of what is called a "1.5 apartment" in Brooklyn, New York, where a roommate occupies a larger bedroom and Chu lives in the half-bedroom. The key to the space is the over-sized, custom-made canopy bed, which serves as a multi-purpose piece of furniture. In addition to being a place to sleep, it functions as a sofa, a chair and even a storage compartment.